8/31 Cup of Coffee: Of the four teams remaining in the Dominican Summer League playoffs, two are Red Sox affiliates. The Red Sox2 completed their sweep of the best-of-three series to move on to the semifinals, with the possibility of an all-Red Sox final looming. Lowell moved one step closer to clinching its division, due in large part to the emergence of Bobby Dalbec (pictured, left). The GCL Red Sox missed a chance to solidify their playoff chances, while Greenville held off being officially eliminated from contention for another day. The PawSox offense sputtered against veteran righty Phil Klein (PHI) and a pair of relievers. Three of the team's five hits came off the bat of Dan Butler. Butler has had a solid campaign in his return to the organization; he is batting .324 with 12 doubles in a part-time role. Justin Haley dropped his third consecutive decision despite a solid outing, allowing two runs on six hits in 5 2/3 innings. Haley struck out six and walked a pair. Kyle Martin and Heath Hembree combined for 2 1/3 innings out of the bullpen. Starter Mitch Atkins needed 87 pitches to complete only three innings. He walked four and allowed five hits but escaped with only two runs allowed. Brandon Workman continues to struggle as he rehabs following last year's Tommy John surgery. Workman allowed two runs on three hits in three innings, and has a 9.00 ERA in 10 innings in four outings since he rehab was transferred to Portland. Luis Ysla took the loss after allowing three runs in his two innings of work. The loss ended a series of solid outings for the left-hander -- it was only the second outing since the beginning of July that he surrendered multiple runs. Contact was hard to come by on Tuesday night, as the Salem lineup struck out 17 times against a quartet of Dash hurlers. Rafael Devers was the only member of the Red Sox lineup who was not retired via a strikeout. He was 1 for 4 with his 17th stolen base of the year. Deiner Lopez picked up a pair of hits, and Jayce Ray and Jose Sermo both doubled. Matt Kent took a tough-luck loss, giving up two runs on eight hits in seven innings while striking out six against walking one. The outing was the fourth consecutive quality start for the left-hander. The Drive were able to stave off official elimination from playoff contention with a strong outing from starter Daniel Gonzalez. In the weeks following the trade of Anderson Espinoza to San Diego, Gonzalez has taken over as Greenville's workhorse. He allowed two earned runs on six hits in six innings while striking out five without issuing a walk. Gonzalez turned in quality starts in each of his six August outings, posting a 2.27 ERA and 0.98 WHIP in 35 2/3 innings. He struck out 27 and walked only five in the month. Marc Brakeman struck out two in his pair of shutout relief innings. The former Stanford Cardinal has a 2.93 ERA in 14 relief appearances after posting a 5.72 mark as a starter. Victor Diaz struck out two in a hitless ninth. Josh Ockimey delivered a two-run homer in the seventh inning, his 18th of the season. The 20-year-old first baseman is looking to finish the season on a high note after a long slump. He entered the night with only 16 hits in his previous 117 at-bats. Trent Kemp was 2 for 3 with a pair of RBI. 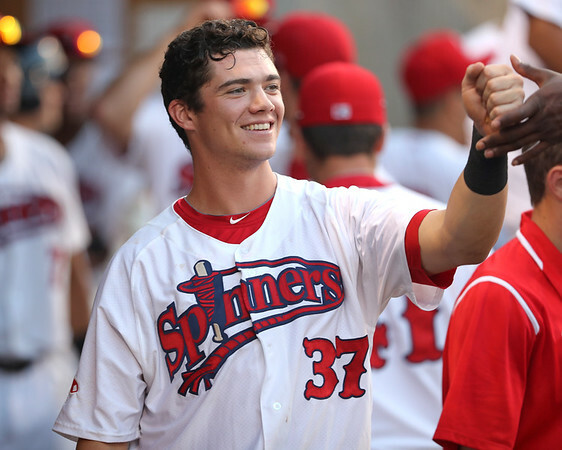 With their sixth straight win, the Spinners lowered their magic number to two with six games remaining. As it has been so often for Lowell, it was Tyler Hill and Bobby Dalbec leading the way. Both players were 2 for 5 with a double and run scored, with Dalbec driving in two runs and Hill adding one RBI. Jerry Downs drove in a pair as part of his third consecutive two-hit game, and Carlos Tovar was 2 for 3 with a double and a run scored. The win went to starter Josh Pennington, who allowed one run on four hits in five innings. It was the eighth time in 13 starts that Pennington allowed one or fewer runs. Pat Goetze surrendered seven hits in three innings of relief, but managed to escape allowing only two runs (one earned). Lowell can clinch the Stedler Division with a win and a Connecticut loss on Wednesday. Little went right for the Red Sox on Tuesday afternoon, as the loss moved them back into a tie for first place with the the GCL Twins. The game got off to an auspicious start when Lorenzo Cedrola led off the bottom of the first with a solo home run. The 18-year-old's second blast of the season put the Red Sox up, 1-0, but that lead would be brief. Victor Garcia surrendered four runs on eight hits in four innings to take the loss, and the Orioles tacked on five additional runs against the Red Sox bullpen. Chad Hardy delivered a solo homer in the eighth, but the game was well out of reach by then. The Red Sox have two regular season games remaining, both with the GCL Orioles, while the Twins close with a pair of contests against the GCL Rays. Half the teams in the Dominican Summer League semifinals will be Red Sox affiliates, as the Red Sox2 outscored the D-Backs, 8-1, in a two-game sweep to join the Red Sox1 in the next round. Juan Hernandez was the offensive star for the Sox, going 4 for 4 with a stolen base, RBI, and two runs scored. Eduard Conde doubled and walked as part of a 2-for-3 performance, and Pedro Castellanos added a double and a run scored. Starter Jose Gonzalez was dominant, allowing only one hit in his six shutout innings. The 18-year-old righty struck out three and walked two to follow a regular season where he posted a 1.32 ERA in 68 innings. Shair Lacrus surrendered the D-Backs' only run, albeit unearned, in the eighth inning. Joan Martinez slammed the door, retiring all four batters he faced. The Red Sox2 will face the DSL Rangers1, who earned a first-round bye. The Red Sox1 will be taken battle the DSL Mariners1, who completed their sweep with a 13th-inning, walk-off, 1-0 win over the DSL Rockies. Player of the Day: The DSL Red Sox2 completed their first-round sweep, and Juan Hernandez was the unofficial MVP. He was 4 for 4 on Tuesday and 5 for 8 in the series. Of the team's eight runs in the two games, Hernandez drove in three and scored two others. It comes on the heels of a season in which Hernandez was one of the toughest outs on the team. The 20-year-old outfielder posted a .413 regular-season OBP while in the DSL. He walked more than twice as often as he struck out.